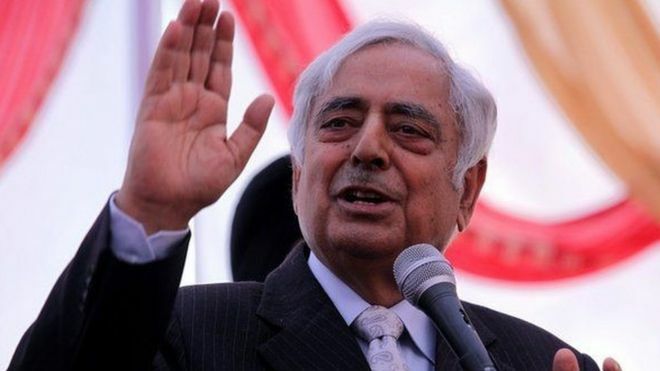 Mufti Mohammad Sayeed owed his rise on the political landscape of Kashmir to the G. M. Sadiq-led Democratic National Conference and the Indian National Congress. During the period of the irreparable damage done to the constitutional autonomy of J & K, Mufti Mohammad Sayeed was G. M. Sadiq’s protégé, and he remained a loyal Congressman his entire life. During these 1950s, which were fateful years in the history of Kashmir, a wide fissure was created within the ruling clique when Bakshi, in his signature style, did not incorporate any members of the Communist faction headed by G.M. Sadiq into the cabinet that he formed subsequent to the 1957 elections. Bakshi’s inability or unwillingness to appease this faction motivated Sadiq to create a separate organization, the Democratic National Conference, with the rebel Communist group of fifteen legislators, of which Mufti Mohammad Sayeed was a part. New Delhi recognized the threat that the rebelliousness of this faction could cause not just to the constructed political stability within the state, but also to India’s relationship with China which was already on the decline. The Chinese government had ratified an agreement with the military regime in Pakistan which specified that after the Kashmir dispute between the governments of Pakistan and India had been settled, the preeminent authority concerned would initiate negotiations with the government of the People’s Republic of China in order to implement a boundary treaty to replace the present agreement. It reinforced its alliance with Pakistan’s military regime by underlining that if that supreme and indisputable authority was Pakistan, then the provisions of the present agreement would be reinforced (Dasgupta 1968: 389–91). The prospect of the Pakistan – China alliance being bolstered spurred New Delhi to bring about a rapprochement between Bakshi’s and Sadiq’s warring factions in 1960. Sadiq and his cohort were reincorporated into the cabinet. A couple of years after this reconciliation, in 1962, Assembly elections were held in the state, and Bakshi and his cabinet colleagues Sadiq, Mir Qasim and Khwaja Shamsuddin won their Assembly seats without even a peep of opposition (Bose 2003: 78). That year elections were held to 60 seats in the entire state, out of which the Bakshi-led NC, which Mufti Mohammad Sayeed had joined, suspiciously won 55; the Praja Parishad won 3 (telephonic conversation with Sheikh Nazir Ahmad, General Secretary of the NC, 8 January 2009). Bakshi’s arrogance, and rampant deployment of corrupt and illegal methods and malpractices in political processes, soon caused him to be an embarrassment for the “democratic” government of the Republic of India, and his mentors in New Delhi had to ask him to step down from the position of prime minister of the state; Bakshi resigned in November 1963. The political bigwigs in New Delhi were concerned that another unopposed election in the state would tarnish India’s reputation as the largest democratic republic. So Nehru’s unsolicited advice to Bakshi was that he would gain more credibility and the elections could boast of an air of fairness if he lost a few seats to ‘bona fide opponents’. Bakshi’s political indebtedness to Nehru and his clique prevented him from discounting Nehru’s advice, and he was replaced as prime minister by a hitherto unknown political entity, Khwaja Shamsuddin. Although the new government was headed by Shamsuddin, Bakshi’s political clout buoyed by his goondaism remained a formidable presence. Consequently, his political rival who enjoyed the patronage of the same political forces that had enabled Bakshi’s ascendancy was not accommodated in the new government (Puri 1995: 45–49). The government of India made several strategic moves to break the spirit of dissident politics and the revolutionary zeal of the people of J & K, the most systemically damaging of which was to expunge the composite culture of Kashmir in an attempt to disseminate the unitary discourse of Indian nationalism. In December 1964, the Union government declared that two highly federalist statutes of the Indian Constitution would be enacted in J & K: Articles 356 and 357. These draconian Articles enable the centre to autocratically dismiss democratically elected state governments if it perceives a dismantling of the law and order machinery. A constitutional order implementing these statutes was decreed by New Delhi (see Bose 2003 and Puri 1995 for further details). In 1965, the Union government fortified its autocratic powers in J & K by getting several corrosive amendments passed in the state Assembly: the Sadr-i-Riyasat or titular head of the state was replaced by a governor, a political nominee appointed by the centre; the title of head of government was changed from prime minister to chief minister, which was the regular title of heads of government within the Indian Union; state representatives to the lower house (Lok Sabha) of India’s Parliament would no longer be nominated by the state legislature but would be elected. These amendments were highly centrist and were designed to corrode the autonomy of J & K provided by Article 370. All doubts about the attenuation of Article 370 were removed when the ruling faction of the NC, led by Sadiq, heralded the dissolution of the party and its subsequent integration into the Indian nationalist Congress Party. This attempt at discounting a historic political movement that foregrounded a separate Kashmiri identity was an exclusionary tactic deployed by the Union government. The Congress Party’s working committee unhesitatingly accepted the integration of the NC (Sadiq faction or Democratic National Conference) into it. This substantive development proclaimed the victory of the Hindu nationalist project in J & K, which had sought the subsumption of religious minorities into a centralized and authoritarian state since the 1940s. The furtherance of the Hindu nationalist agenda in the state was enabled by the complicity of one of the architects of democracy and secularism, Jawaharlal Nehru. His adherence to the unitary discourse of nationalism galvanized the suppression of demands for the autonomy of J & K state. These integrative and centralist measures were met with massive opposition, which the Indian government suppressed with bloody maneuvers. The volcanic nature of the protests in the Valley gave a veneer of legitimacy to its action of large-scale repression of leaders of the Plebiscite Front. Abdullah was also arrested, for the umpteenth time, under the Defense of India Rules, to further hush the voices of dissent. The uproar in Kashmir was an opportune moment for Pakistan to jump in the fray; this augmented the unrest and led to an India–Pakistan war in 1965 (see Dasgupta 1968). The flames of discontent in Kashmir were fanned by Pakistan, which expected cooperation from the Muslims of the Valley. But it ended up being disappointed because the Kashmiri populace did not get involved in the war on a massive scale. Eminent political and social activists like Prem Nath Bazaz, Jayaprakash Narayan, etc., conceded that India’s image as a secular democracy had been tarnished by its repressively undemocratic tactics in the state (ibid. ; see also, Akbar 1985). The 1965 Indo–Pak war proved disastrous for both nation-states. In an attempt to save face, the two sides agreed to a UN-mediated ceasefire, which took place on 23 September 1965, in Tashkent, Russia. Talks between Russian Premier Alexei Kosygin, Indian Premier Lal Bahadur Shastri and Pakistani President Ayub Khan led to the ratification of an agreement, the Tashkent Declaration. The Tashkent Declaration emphasized the resumption of dialogue between India and Pakistan through peaceful negotiations, and a rapprochement that would facilitate the development of amity between the two countries. In other words, the Kashmir conflict was consigned to a position of reduced political import. The Declaration was perceived by the people of both India and Pakistan as a despicable act of evasion, and was received with hostility by them: “Despite domestic opposition, both sides did respect the terms of the Declaration at least as far as practical measures were concerned. Prisoners of war were repatriated. . . . However, respecting the spirit of the Declaration (resolving disputes peacefully, promoting friendly relations) proved more difficult” (Malik 2002: 124–25). The disregard of the will of the people and the steady dissolution of democratic institutions caused colossal damage in the state of J & K, the effects of which came back to haunt India in 1989–90. Despite the publicly voiced protestations by people who had access to the higher echelons of power, the 1967 elections in Jammu and Kashmir did not bear testimony to India’s democratic façade. Mufti Mohammad Sayeed was made Deputy Minister for Agriculture by Sadiq in 1967. Congress candidates supported by the Sadiq–Qasim faction of the NC won in 33 of the Valley’s 42 constituencies, 27 of Jammu’s 31 constituencies, and 1 of Ladakh’s 2 constituencies– indubitably a large number. The draconian nature of the 1967 electoral process in J & K further entrenched corruption in the soil of the political culture, which is an albatross from which the people of the state, thus far, have not been able to free themselves. The official candidate from the southern Kashmir town of Anantnag was Khwaja Shamsuddin, who had been the prime minister of J & K for a few months in 1962–63. Predictably, he was elected unopposed after papers filed by five other candidates were summarily invalidated. Of the 118 candidates whose papers were nullified, 55 were rejected because the candidates had declared their unwillingness to take the mandatory oath of allegiance to India. The government efficiently deployed the machinery and infrastructure available to it in order to ensure the victory of its political organization, winning 61 of the 75 seats (telephonic conversation with Sheikh Nazir Ahmad, General Secretary of the NC, 12 January 2009). Clearly, India left no stone unturned to ensure the victory of its cronies and the defeat of its ideological and political opponents. New Delhi’s master of subterfuge greased the wheels of rampant deployment of governmental machinery to ease the path of the ruling party to victory and to delegitimize dissident politics (see Akhtar 2000 for further details about the corrupt practices that were legitimized during the 1967 Assembly elections in J & K). The use of such discreditable methods enabled the Congress to create the semblance of a base for itself in the Valley, which, prior to these elections, had been non-existent. An unforeseen development that year was the opposition of Bakshi Ghulam Mohammad, prime minister of J & K from 1953–63, to the Congress parliamentary candidate from Srinagar constituency as a candidate of the straggling faction of the NC. In an interesting reversal of political fortunes, Bakshi’s faction of the NC won 7 seats in the Valley and 1 in Jammu that year. Not one to be easily slighted, the heretofore autocrat, known for his corrupt politics and brutal repression of dissent, proclaimed himself a Kashmir nationalist who was willing to fight tooth and nail against the centrist and integrative policies of New Delhi. This sudden and unexpected shift to regionalism and Kashmiri nationalism was Bakshi’s ticket to the Indian Parliament. He was elected as the parliamentary representative from Srinagar (Lamb 1991: 209–10). The status of the ruling faction as a non-entity was reinforced when the brief release of Sheikh Mohammad Abdullah from incarceration in 1968 was greeted with overwhelming jubilation in the Valley. The “Lion of Kashmir” was welcomed by the people with such uninhibited exuberance and joy that the foundations of the Congress in the Valley were palpably shaken. Soon after his release, Abdullah addressed a mammoth gathering in Anantnag on 26 January 1968, in which he unhesitatingly voiced his dissident ideology. He made it clear that India’s undemocratic and oppressive tactics would not inhibit the passionate desire of the Kashmiri people to be free. He also reminded India of its unfulfilled promise to hold a referendum in Kashmir and enable the people to exercise their right of self-determination. The regionalist and dissident policies of the PF had garnered overwhelming support, reducing the ruling elite to a caricature. In January 1971, externment orders were served to the leaders of the Front, Sheikh Mohammad Abdullah, Mirza Afzal Beg, and Abdullah’s older son-in-law, Ghulam Mohammad Shah. Beg was on his way to Kashmir from New Delhi by road, and Sheikh Mohammad Abdullah and G. M. Shah were flying to the Valley from the capital. The flight that Sheikh Mohammad Abdullah should have been on was cancelled because of a bomb hoax, and the same evening they were served with externment orders, preventing them from re-entering J & K. Beg was stopped on his way to the Valley and told to turn back. In addition to the top brass of the PF being confined in New Delhi, a large number of members of the organization were arrested under the Preventive Detention Act. In another unforeseen and interesting development, a pro-Pakistan religious organization, Jamaat-i-Islami, which tacitly supported the Mufti-led PDP in the 2008 and 2014 elections – which had insistently disavowed Kashmir’s accession to India, and is currently a vocal opponent of elections held in J & K within the framework of the Constitution of India – in a tacit understanding with the Qasim regime, managed to get 5 representatives accommodated in the Legislative Assembly. In the parliamentary election, Bakshi Ghulam Mohammad again contested from Srinagar. Only, this time, he disavowed his Kashmiri nationalism and was patronized by the official regime with its unitary politics of Indian nationalism. Bakshi had once again engaged in a political volte face with the ease of a carpetbagger. But this time he was vanquished by a charismatic independent candidate tacitly backed by the PF, Shameem Ahmad Shameem, who won by an enormous margin. Although the PF managed to gain such victories, Sheikh Mohammad Abdullah felt compelled to sever himself and his organization from their former credo of self-determination. Mirza Afzal Beg negotiated with the government of India for Abdullah’s release from incarceration and his position as head of government, and signed another “Delhi Accord” with the centre in 1975. This was a time when Mufti Mohammad Sayeed was Mir Qasim’s right-hand man. Although the centre proclaimed that the state would continue to be governed under Article 370, between 1954 and the mid-1970s New Delhi issued 28 constitutional orders ratifying the integration of J & K into the Indian Union, and 262 Union laws were implemented in the state, reducing its autonomy even further. In effect, the Congress government at the centre made every attempt possible to render the state government defunct. Indira Gandhi’s government condescended to allow Abdullah’s state government to legislate on issues of culture, religion, and the Muslim personal law. The display of India’s superior military strength and strategic dexterity during that war diminished Pakistan’s stature. The Simla Agreement, ratified in 1972 by the then Pakistani Prime Minister Zulfikar Ali Bhutto and the Indian Prime Minister Indira Gandhi soon after the 1971 war, underlined the bilateral nature of the Kashmir issue; entrenched the ceasefire line, thereafter referred to as the Line of Control (LOC); reinforced the validity of the UN charter as governing relations between the two countries; and agreed to reaching a final settlement of the disputed area in J & K (Margolio 1999: 73–74). The common perception in India was that the Simla Agreement was a tacit acknowledgment of the Indian Union’s claim over the state. This perception in politically influential circles seemed to give a much yearned-after legitimacy to India’s centrist policies. In a strange turn of events, however, the Congress chief minister of J & K, Mir Qasim, stepped down of his own volition and asked Sheikh Mohammad Abdullah to replace him as head of government, which is when Mufti Sayeed was appointed president of the Congress party’s state unit.. Despite the dominance of the Congress party in the Legislative Assembly, Sheikh Mohammad Abdullah was elected leader of the house. New Delhi, consistent with its dubious record, had made every attempt to disempower Sheikh Mohammad Abdullah and his organization, but his iconic status and the resurrection of the PF as the NC defeated its nefarious designs to eliminate oppositional politics in J & K. Sensing Abdullah’s disregard of the emasculating conditions of the Delhi Accord, the Congress withdrew its support for him in 1977 and fresh elections were held. The 1977 elections were a landmark event in the history of Kashmir, with Sheikh Mohammad Abdullah’s NC eradicating the Congress presence in the Valley and capturing an indisputable majority in the Legislative Assembly, 47 seats out of 75. The strength of the Congress was reduced to a mere 11 seats, greatly diminishing its hitherto fabricated larger-than-life presence in J & K. The political ideology of the Jamaat-i-Islami was unable to importune the electorate and secured just 1 seat. The fairness of the 1977 election has been highlighted by many political analysts: it offset the preposterous elections held in J & K between 1951 and 1972. Democratic elections, the installation of a representative government and the forging of a political space that accommodated multiple ideologies contributed to the creation of a non-repressive, relatively stable political atmosphere. The incredible victory of Sheikh Mohammad Abdullah and his political organization in 1977 was a sore spot for Mufti Sayeed, a wound that never healed. In the short tenure as Chief Minister in 2015, he made a couple of attempts to claim ownership over Sheikh Mohammad Abdullah’s contributions, which I thought spoke volumes about his raw nerve. For what it’s worth, God bless his soul! This entry was posted on Friday, January 8th, 2016 at 00:03	and is filed under Uncategorized. You can follow any responses to this entry through the RSS 2.0 feed. Both comments and pings are currently closed.